OCMGA Master Gardener David Calle is passionate about gardens — especially historic gardens and finding a way to incorporate lessons from the past into our own gardens. I’m crazy about his stories and one of his recent ones “Bulb Farmers Rock” really captured my fancy because, on my bucket list, is a trip to Keukenhof when the bulb fields are all in bloom. Take a minute to enjoy David’s blog post, and subscribe so you won’t miss future blogs! 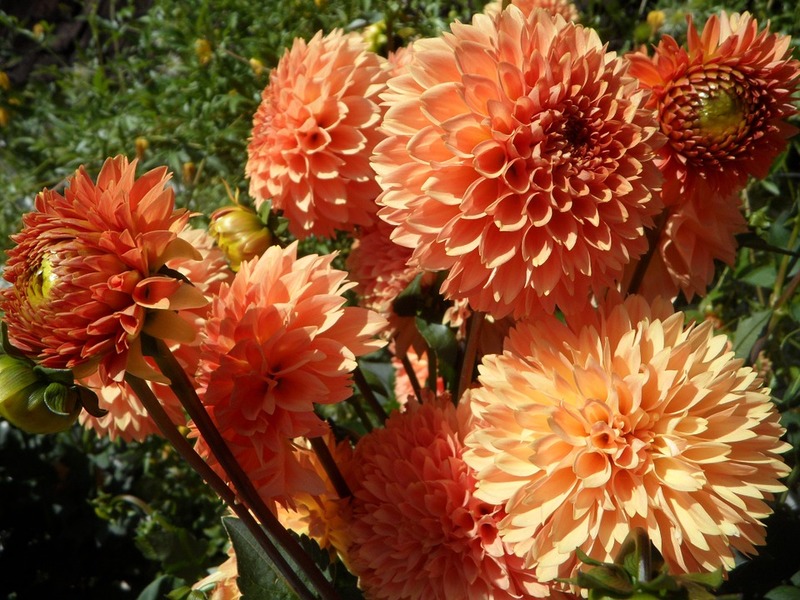 Dahlias will not winter over in places where the ground freezes, but they are easy to store if you have a cool place to keep them. Start by making labels while the plants are still blooming, so you remember which color is which. Wait until frost kills the top growth, then as soon as there is a dry day, cut off the dead foliage leaving stubs 2 inches long. 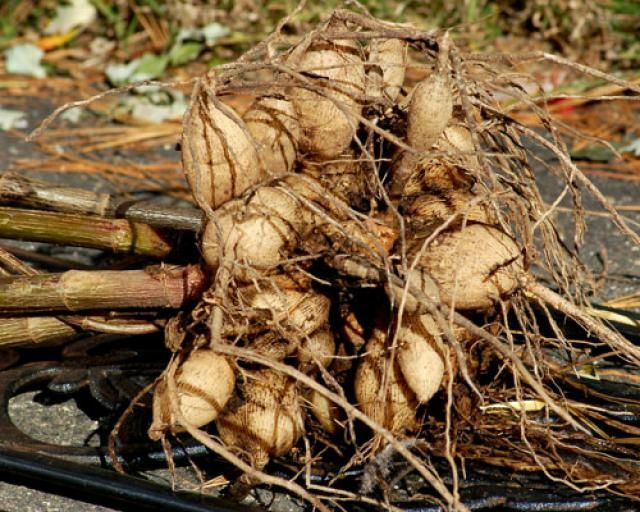 Use a digging fork to lift the tubers; turn the clumps upside down. Let the tubers dry a few hours, then gently remove as much soil as possible. Don’t wash them off, as the last thin layer of clinging soil will help protect them from shriveling. Line a large box with a plastic bag; then add a 4-inch layer of coconut fiber, dry shredded leaves, styrofoam packing peanuts, or sawdust. Place tubers stem side up on this bed, keeping them well separated. Nestle the labels into the clumps. Completely surround the tubers with additional packing material, and loosely close the bag. Store in a dark place, ideally at 35º to 45ºF. When storage temperatures climb to the mid 50s, the tubers will start sprouting. Ignore short sprouts; they’ll be buried when you plant. Clumps that come from storage with long, pale stems, however, should be hardened off before being set out into the garden. In the spring, as long as there are a couple of healthy-looking eyes (the buds from which the plants grow, located up near the old stem), even rather shriveled tubers will make decent-size plants. If shoots have started to grow, evaluate them before planting. If they are still small (less that 2 inches long), just bury the tubers as you would normally, a couple of inches below the soil. If the shoots are long and pale, they will be too far along to bury completely; they’ll also be brittle and vulnerable to sunscald, so handle carefully. Toughen up the shoots by putting the tubers with their new growth in the shade for a week or so before planting. Plant the tubers at the normal depth, with the long shoots above ground, and continue to protect the shoots with a light sprinkling of straw for the next week or 10 days. The idea is simply to shade the bleached growth until it turns green, so don’t smother it with a heavy layer of mulch. Are your caladiums so beautiful this year that you can’t face the thought of getting rid of them when the summer is over? Why not try to keep them until next summer?! They can be left in the garden into fall so that the leaves can continue working and the tuber can continue to grow larger. However, once frost is in the forecast, don’t wait — just dig, taking up the whole plants or only the tubers. To winter over a caladium, put the tuber into storage immediately or pot up the whole plant and place it in a brightly lighted windowsill. By late January, the caladium is going to look tired and will need to rest before the tuber is repotted in the spring or planted in the garden after the soil has warmed up. Chop off the foliage, knock off the soil, and let the tuber dry at room temperature. Any condensation will encourage bacterial rot. Store the tuber in dry vermiculite or in a mesh bag (like an onion bag) in a dry place, ideally at 70º to 75ºF but never below 50º, making sure there is good air circulation. Remember: it needs to be stored dry!! 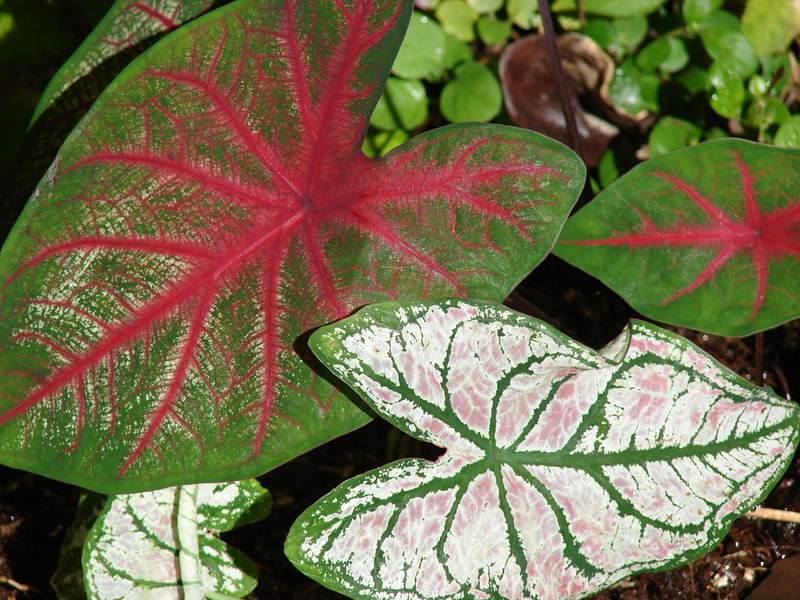 Caladium is an extraordinary foliage plant. Its leaves can be white with narrow green borders or combinations of white, green, and rosy pinks, in pale to outrageous patterns that approach a third grader’s first attempt at stained glass. Most caladiums are hybrids of Caladium bicolor or C. picturatum, native to the tropics of the Americas and the West Indies. Plants can be costly, but tubers are inexpensive so you can just say goodbye at frost time if you like.